For most of us, typing supplanted the pen and pencil years ago—nowadays, anything longer than a thank you note feels odd to write on real paper. Sadly, the keyboard is taking the great, weird eccentricities of handwriting with it. After all, your handwriting used to signify your personality, your education, it was something to be obsessed over: One of my earliest memories of school was sitting inside during recess because my cursive sucked. Its disappearance is often overlooked when we talk about the cultural changes that the digital age has brought about. So here's a little survey: Show us what yours looks like. Snap a picture of a letter, a notebook, maybe just a sentence scrawled on the back of an envelope, and post it in the comments. 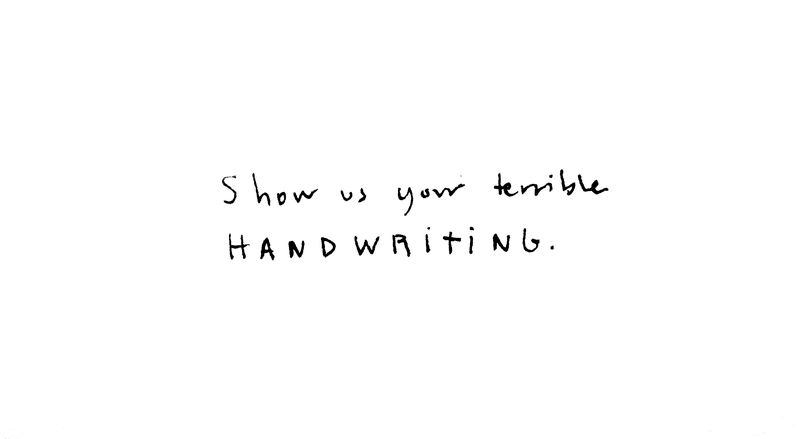 And please, don't make it pretty—I sure didn't, above—just jot something down like you normally would. And also, this seems obvious, but don't include your signature, name, or address! We'll post the comments tomorrow—which, incidentally, has been designated National Handwriting Day by the powers that be (in this case, the pen lobby).